Laser Versus Conventional Cleaning Methods: Do the Costs Outweigh the Benefits? 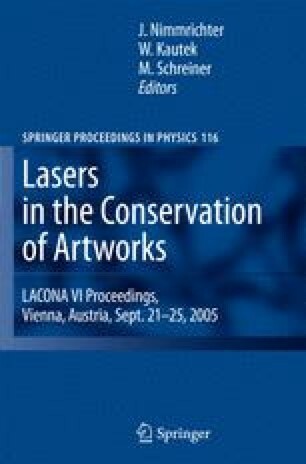 Art Conservation B.V. participates in the PaReLa project, a European Commission funded, cooperative research project entitled ‘Paper Restoration using Laser Technology’ (EVK4-CT-2000-30002). The purpose of this project is to develop a laser system suitable for the accurate, efficient and safe cleaning of paper objects. Other participants include BYB, Guillet, Hai Yen, Susan Corr, TNO, BAM, ICN and FORTH. Our paper discusses the research outcomes and the feasibility of this method in practice. For research purposes we aged a great number of samples, plastered with different types of tape, in special ovens. Next we carried out experiments using various types and doses of laser light to determine how the adhesive residues can best be removed. It appears that the laser system can yield excellent results.